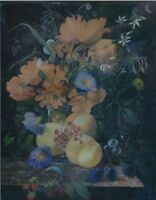 Dutch Classical Style Floral Still Life Oil Canvas Painting By Frank Shipsides. 19th Century Flemish/Dutch Style Gouache Still Life "Flowers and Fruit"
Peasants in a Tavern Interior. A very fine 18th century oil painting on panel depicting peasants in a tavern interior. 18th Century Dutch School. Original Oil Painting on Panel. Painting - 26cm x 21.5cm.